Champion Lawn Ornaments began in 1989. It originally began as a partnership between Jerry Ritenour and his nephew Dave Cramer. They started the business as a side adventure since they both had full time jobs, Dave working in a factory and Jerry running a home construction company. Their biggest selling item at the time was lawn sheep. Each year they would make a trip to Lancaster and returned with new items to sell. 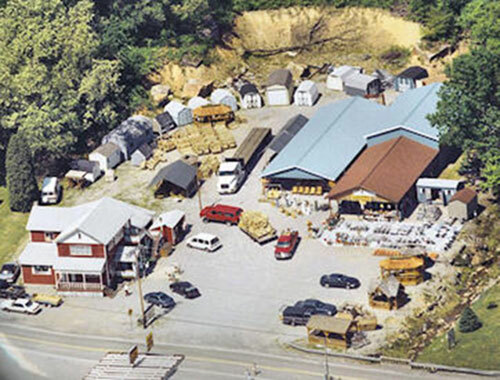 In 1992 after meeting with different Amish shed builders and looking at the quality of workmanship they forged a partnership with an Amish craftsman from the Lancaster/New Holland area. From Jerry’s experience as a home builder he knew what to look for and to make sure no corners were being cut. Their goal was to bring the highest quality sheds at the most affordable price to the customers of Champion Lawn. Next they added gazebos and outdoor furniture all made by different Amish craftsman. This has been a great success! We not only have the highest quality of Amish made products available but we have created friendships with the craftsman we deal with. In 2000 Jerry took over as sole owner. Once again changes were in the making. We expanded the show room and with the help of Jerry’s wife Kirsten they added a large line of gift accessories, expanded our indoor furniture line along with our concrete statuary line. Outside we expanded the line of outdoor furniture and increased our storage shed area. We now have eight styles of storage sheds to choose from, single and 2 car garages, horse barns, seven styles of gazebos, eight styles of swings, gliders, gliding settees, seven styles of picnic tables and so much more. 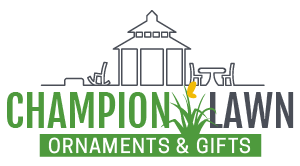 When you visit Champion Lawn Ornaments & Gifts you can enjoy browsing our outdoor displays as well as our inside gift shop. We look forward to seeing you.